There was a slight bit of tension at one point when a rather inebriated gentleman asked Mark if he could have one of his paintings free of charge, to which Mark sardonically replied, 'Well, I suppose you could try to steal it!' 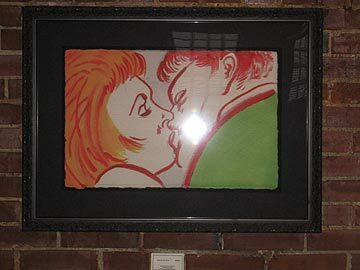 Unfortunately, he took Mark's response a bit too literally, and tried to make off with the piece of artwork (titled Kissers Go At It - pictured here). Thankfully, Chip Schloss came to the rescue at that moment and asked the gentleman to leave. Thank you, Chip! Please don't use w/o permission.